Welcome and hello! Thank-you for joining us from The Indextrious Reader. After The Nervous Marigold, you can head over to Books and Quilts and check out her post. This is the fifth and last day of the Scribbling Women Blog Tour, Tundra Books third blog tour effort. For this tour, Tundra is hosting a huge giveaway: they will choose at random from people who have commented on any or all of the blogs visited on the tour, and give away a complete set of Marthe Jocelyn books - 28 books in total, for readers from toddler to young adult. So read, comment before midnight EST on APRIL 10, 2011, and enjoy! And hopefully YOU will win. 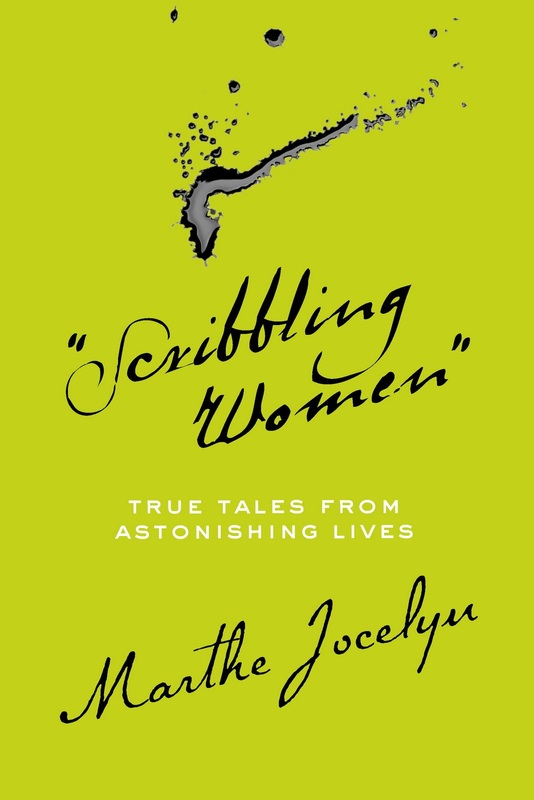 When I started doing a little looking around to figure out what I might want to say, I checked in with the LibraryThing algorithm, which told me: "you will love "Scribbling Women": True Tales from Astonishing Lives (prediction confidence: very low)". What that means exactly I'm not sure. (I had really enjoyed another ARC of Marthe Jocelyn's novel Would You. I wonder if that is their only clue?) The title of the book is right up my alley. And a Blog Tour: that’s something new – I’m all over that. I loved the idea of reading any book being handled in that way. I came up with an idea straightaway. How about Scribbling Little Women? Reviews from little writers? I decided to hand the book around to a couple of girls I know in that category, girls who are voracious readers and writers themselves, to see what they came up with. Because of the timing, I wrote my review before doing anything else. I always like to respond naturally, then see what else is out there. Then I thought up my questions, collected back kid reviews, and the answers from Marthe. I have to say that I felt a little self-conscious writing with a certain, yet unknown audience in mind, including the author and the publisher, rather than imagining myself in a conversation with my friends. Then, in reading the book, the story I found most interesting was that of Margaret Catchpole, a woman convict, and one of the first 20,000 convicts sent to Australia. Her 11 letters sent back to England remain a precious entry in the scarce record of the founding of a colony. When I talk about Scribbling Women, I find myself mentioning that story. Another compelling story that stayed with me was that of an Inuit writer. Ada Blackjack was a seamstress who accompanied a doomed attempt to colonize an arctic Russian island for Canada. Her writings were so "outsider" that her section was fascinating, if gruesome (like all arctic/antarctic explorer writing). On the other hand, another story that stuck, because I was slightly repelled by it, was that of Daisy Ashford, a Victorian girl who wrote (dictated really) a book at the age of 9, a silly, simpering book that mind-bogglingly REMAINS IN PRINT! Will it have a boost in sales thanks to Jocelyn? When I offered the book to some young ladies who read and write, and invited them to submit a review, they agreed with enthusiasm. Interestingly, they each chose to focus on one story and responded directly to the source material and the characters, rather than the sense of the collection or the collector. I guess that is just as it should be - the book is a showcase, the writer Jocelyn functioning as a virtual librarian, making suggestions to her patrons. Before I begin, I must confess to something. When I was choosing which ‘scribbling woman’ story to read and write about, I was attracted to the story and character of Isabella Beeton not because I had heard of her (or her book), not because the short description intrigued me, not because the picture interested me, but because I am also an Isabella. Working from that point and reading her story, I became more and more involved in the story of her works, and was even able to make connections between the two of us. As I read her story, I was struck by several things. 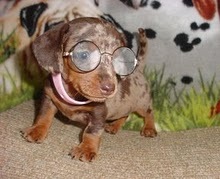 Thing one: how young Isabella was when she wrote her book. I tried to do the math, and from that I concluded that she was between 25 and 30 years old when she wrote Mrs. Beeton’s Book of Household Management: Comprising information for the Mistress, Housekeeper, Cook, Kitchen-Maid, Butler, Footman, Coachman, Valet, Upper and Under House-Maids, Lady’s-Maid, Maid-of-all-Work, Laundry-Maid, Nurse and Nurse-Maid, Monthly Wet and Sick Nurses, etc. etc. Also Sanitary, Medical, & Legal Memoranda: with a History of the origin, Properties, and Uses of all things Connected with Home Life and Comfort (which I will shorten and from hereon in call ‘Mrs. Beeton’s Book). If you ask me, the title alone is an impressive literary work for a young mother! Thing two: how long the book was! I was lucky enough to get my hands on a copy of Mrs. Beeton’s Book from my grandmother, and I was surprised to see how thick (and heavy!) the book was! Of course, this copy was a facsimile, printed in 1968, and not an original from the 1860s. I couldn’t stomach the idea of reading through it (was there ever any intention of doing so?) and so I flipped through it briefly, occasionally stopping to read a particularly interesting-looking article. Thing three: the things people ate! Isabella’s Hessian Soup recipe calls for half an ox’s head. At first, I just skimmed over it, not really noticing the strangeness of this ingredient. Then it registered in my brain, and I did a sort of a double take, like, half an OX’S HEAD? Where did these people get half an ox’s head? Another definitely odd ingredient was 1 pig’s face; salt, for a dish called Collared Pig’s Face, which Isabella described as ‘a breakfast or luncheon dish.’ This recipe was also enhanced by a very useful drawing of a pig’s face. While the people who ate Collared Pig’s Face may have enjoyed it thoroughly, from the illustration I could gather that the pigs were not very happy to have their faces ‘collared’ and eaten. The fourth and final thing: how many servants people had. From the title, you can see that people in Isabella’s time had lots of help around the house. I couldn’t even tell what some of these jobs were. (by the way, the terms Upper and Under House-Maid are not in Wikipedia, except in the link for...Mrs Beeton) I looked for the terms in Mrs. Beeton’s Book, but the vast quantity of information hid them from me. Another thing I noticed was a strange connection between Isabella’s life and works and the meaning of our name. Isabella is a variant of the Hebrew name Isabella, meaning God is my word. Isabella’s book of instructions is like a passing on of her word. Isabella’s book and story were inspiring and interesting, and continue to interest and inspire me even after reading about her. 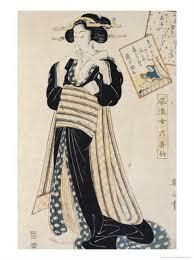 I have chosen to talk about Sei Shonagon. Sei was an amazing woman. She was able to express her feelings or emotions or thoughts through a book or a poem or even her diary. Her story of working day or night on a project is simply astonishing. Her opinions of people too. Sei's father and grandpa were in the same occupation as Sei: poets in the Japanese court, around the year 1000! It is a mystery how Sei died but she sure is a scribbling woman! It is nice how Marthe brought me Sei's story and taught me about her. Thanks Marthe Jocelyn! Here are the questions I sent Marthe. Her answers were interesting and informative, although I felt there was some disconnect between the questions I asked and the answers I got. As a default I included both sides verbatim. Nervous Marigold: Is it an artistic decision or a marketing decision to keep this book to a young readers category? I mean did you envision reaching girls, or agree to scale the work to address a young audience because that is where your reputation has been made? Marthe Jocelyn: I intended the book for young readers, aiming at about 4th grade through 7th or 8th grade. Kids start paying attention to the wider world during those years, and biography becomes a big part of their studies. I wanted to introduce a few non-famous, yet extraordinary women. NM: Who were the other writers that might have been on the short list, but didn’t make the final cut? The final list is so quirky I wonder about the near misses and what distinguished the writers you did choose. NM: A little scribbler's question: You write "The Beetons' second baby was born...[and] following common custom, he was also named Samuel." Then, "...the second Samuel became ill...and died..." but the next son was called Mayson. Why was he not also called Samuel? What is the custom, then, please? MJ: I could not find a factual explanation in the Beetons’ writing to explain the choice of names for their children. My guess, however, is that after two Samuels died, they likely hoped that calling the third boy Mayson would be a good omen for better health. Mayson was also a family name. NM: What is your dearest hope for what happens when young people read this book? I have some ideas of what you might have wanted but I want to know what YOU REALLY want. I read the book quickly, and with pleasure, but I can't say I would bother to search out the source materials for any of the women who were new to me. I was surprised because that was my first guess as to what Marthe might have wanted. After much thought, I had decided that perhaps Marthe's message was more like "Live your life in an interesting way, and maybe you, too, can record it if you like," rather than a specific inspiration to write, or try these kinds of adventures, or follow up on these women in particular. In the end my take-home from the book was Marthe's 'To Do' list at the end of the book - her personal response to the stories to which she exposed herself. I loved that bit. However, in the final analysis, the reason Marthe Jocelyn is a successful writer is that she absolutely manages to connect with her target audience, and did so in my small sample. The girls were curious enough about the Scribbling Women to choose to read a story, one also was curious enough to spend some time with the source material and research a little further into what she found there. It is immaterial that I responded to the book differently, and I am quite happy it worked that way. The Marigold wonders nervously: Is it too compromising to be giving a review to a publisher? Have I been co-opted, in a way I find suspicious among reviewers of all kinds? Can one really be brutally honest in these cases? Hmmm. I think you were wonderfully honest. The book was written for a teen or pre-teen audience. Adults usually look for something different, more, in a book. Great idea to share it with some younger readers and include their comments. Thanks for your honesty, souci, and thank you also for passing the book along to young readers. Isabella is ready to have her own blog, I'd say! I like these collections for middle school students - in all those chapters, most readers will find someone to identify with, or someone about whom they'd like to a little more research. So many factors affect book reviewing, and it is difficult to be truly unbiased/unswayed by external factors, but, as with your LT reviews, I think you are fair. i don't really understand this review. apparently you didn't like marthe's book--or did you? im not sure what an 'ooooh' tone is, although clearly it is not something good. i myself loved this book, and don't know how the word 'weak' could be applied to a book about such strong women. as i said i have no problem with someone criticizing and not liking a book, i was just confused in this case as to why. ps. i agree with marthe that isabelle is ready for her own blog! So, Nervous Marigold, I'm glad you've given some valuable tidbits about the women Marthe Jocelyn chose to include in her volume - the harsh Polar zones, Mrs. Beeton's recipes(?!?!?!? ), Australia in a time warp - you've definitely piqued my interest! I might just pick up this book and read it! First I must agree that Isabella should have her own blog. Her review was interesting and thoughtful. I am always happy to see women's writing getting noticed, especially being read by girls or perhaps I should say young women. Sounds like a fabulous book. I enjoy hearing great stories about independent women. First of all, thank you Marthe for your compliment! I do in fact have a blog (or two!) but I don't visit it much. I'm hoping to get one back on track soon. I really enjoyed your book, and also your review, Souci. I have also read many scribbling woman stories in many stories and I have also decided write these stories many times. I usually love to read all of these books. And they are very nice. All the pictures which are given over here are very beautiful.